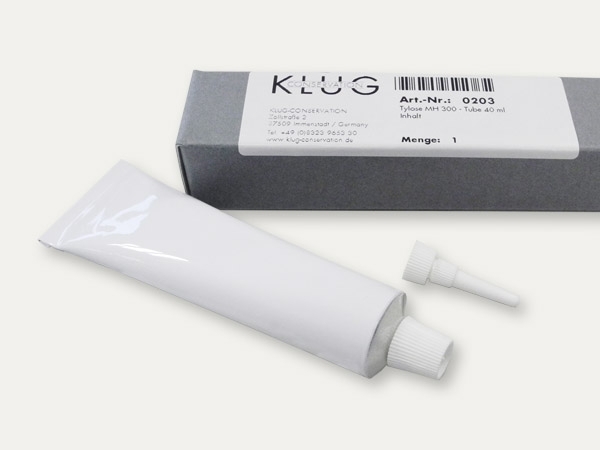 A suitable glue for file preparation (treatment), mounting of objects and other applications in the conservation and preservation fields. From the conservation point-of-view, the cellulose derivative Tylose MH300 (methyl hydroxyethyl cellulose), is a totally harmless and reversible glue. This biopolymer is usually utilized in the field of paper conservation. It is physiologically harmless and water-soluble. Micro-organisms can affect this adhesive with great difficultly.